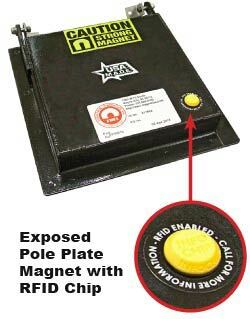 For Immediate Release: Posted On 5/15/2012 By Industrial Magnetics, Inc. The RFID(radio frequency identification) device, manufactured by InfoChip®, aides maintenance and quality personnel in documenting the magnetic separators’ location, inspection history, safety compliance and maintenance record as part of their company’s control programs. The RFID chip can be read with most standard readers, or one of several models available for purchase from InfoChip®, who also offers complete desktop, online or mobile software solutions for companies without an existing program. States Dennis O’Leary, IMI’s General Manager, “We recognize the importance of RFID technology in today’s Quality Control and Maintenance Programs. Adding RFID as a standard feature aligns with our goal of constantly striving to add value to our products." The RFID’s durable, low profile design measures .75" dia. and features extreme-environment adhesive that can withstand temperature ranges from - 80° to +400° F. The RFID device will come standard on IMI’s Bullet Magnets, EP Tube Magnets, Pneumatic Line Housing Magnets, Drawer-in-housing Magnets and Plate Magnets. For more information on RFID features and options, visit InfoChip® on the web at www.infochip.com or contact Industrial Magnetics, Inc. at www.magnetics.com, 888.582.0821/231.582.3100 for more information on their magnetic separation products.